What is the best way to drink Guinness Foreign Extra Stout – chilled, at room temperature or should I crack an egg into it like how old macho men do? Ok here’s the back story. Someone gave me a can of Sir Arthur Guinness’ finest from St James’ Gate Dublin brewery yesterday and told me to drink it. Well, I do like Guinness draft beer poured straight from the tap a lot. Chilled and served in a pint glass – it’s one of life’s greatest pleasures, especially when you’re in an authentic Irish bar. Now stout on the other hand… I’m not so sure how my palate is going to feel. Yet I’m always one to try new things and to learn new experiences. I mean I will never say no to things I have yet tried before. So here I am, going to try stout beer for the first time. HOW EXCITING! Bet you’re sitting right at the edge of your seat now, silently cheering me on in your head. It was satisfying to hear the crisp sound of the can ring being pulled open. There was a faint sizzle of bubbles from the can. As I poured the dark frothy beer into the glass, a beige creamy head of froth began to fill the glass up. The sight of the black liquid settling into the glass was bewitching. This should not taste any different from the draft beer. Ok, maybe it will be slightly more bitter. But really, it should just taste like cold unsweetened black coffee. Which is similar to how I take my coffee – unsweetened and with some milk. So I took a long sip of the tall cool drink. And it hit me. The first splash of stout onto my tongue had a sharp bitter taste but it was nothing I couldn’t handle. The rest just flowed smoothly down my throat, leaving a slightly roasted taste lingering in my mouth. I felt like I was drinking the draft beer but with a sharper bite to it. It was great! I can’t believe it was much better than I had expected. I thought I’d hate it. I was even bracing myself to finish drinking it by force. 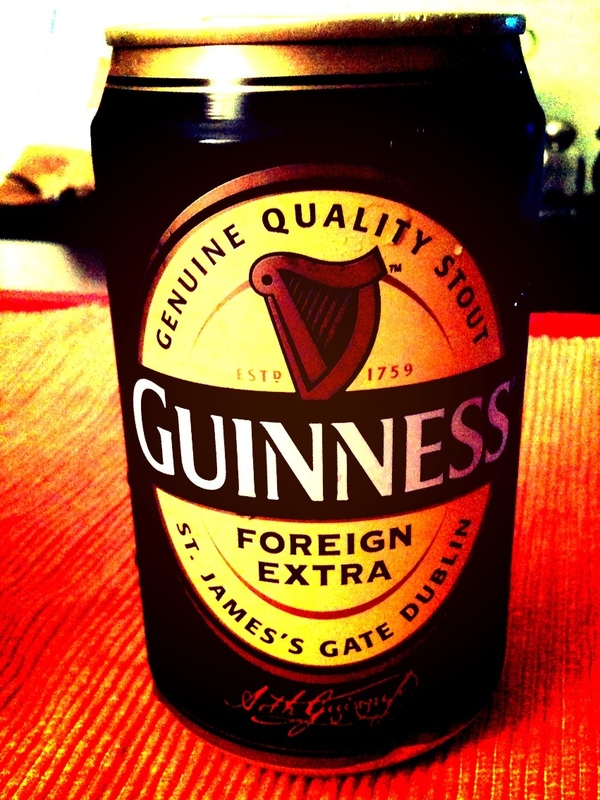 But you know what, I think Guinness Foreign Extra Stout can be my new poison of choice from now. Only hitch I see so far is that it has 6.8% alcohol volume and I have only taken three mouthfuls from the glass and my face is now as red as a fresh yummy cooked lobster. ALL WITHIN 10 MINUTES OF DRINKING ALCOHOL. You can probably understand why I hardly drink any sort of alcohol during lunch. My face would light up like your favourite red Christmas lighting. And it would be obvious to everyone that I was drinking on the job. And we wouldn’t want anything bad to happen to me now, would we? Well, I feel extremely hot all over now, with heat rising out from every part of me. It is as though all my quota for blushing in a lifetime has been set to unlimited tonight. If you could see me now, you’d be wondering why there is a blood red tomato typing on the phone. And I have about three-quarters of stout left. I think I could be drunk in another 15 minutes’ time. Then I can float off to a woozy lightheaded giggly paradise. What can I say? MY LIFE IS FREAKING AMAZING.